The 2510 km long Ganges or River Ganga is the holy river of Hindus, which is worshipped as a Goddess. This is the second largest river in the subcontinent of India, emerging from the Himalayan state of Uttarakhand in India. In its long course, the Ganges passes through major cities like Allahabad, Pataliputra, Kara, Kannauj, Baharampur, Murshidabad and Kolkata. The legend associated with Ganges is that, this river originally existed in the Heavens. Bhagiratha, a famous king, in seeking salvation for his ancestors who were cursed by an oracle, performed penance and meditated compelling the goddess Ganga to come down to Earth. Then Ganges came down to the Earth through a lock (Jata) of hair of Lord Shiva, making the earth fertile, pure and free of all human sins. The main Ganges is connected with 6 headstreams, among which Bhagirathi River is considered to be the source stream of the river Ganges. Arising at the foot of the Gangotri Glacier, named Gaumukh at a height of 12769 feet, the river Ganges moves through the holy city of Hardwar, then Kanpur, then Allahabad, where it is joined (Sangam) by Yamuna, another river in India. It distributes itself into two rivers Hooghly and Padma near Farakka. 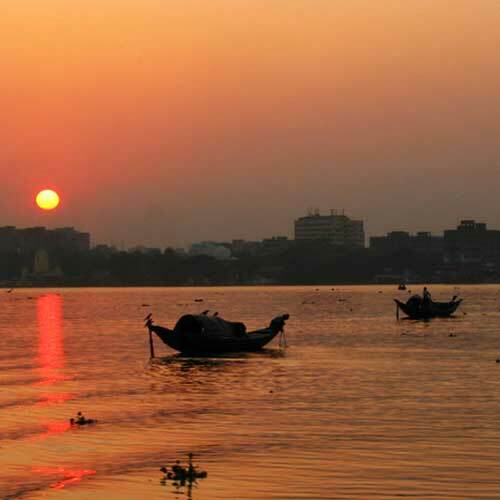 Padma River enters Bangladesh further moving through the Meghna Estuary, where it finally meets the Bay of Bengal. In the Indian part Ganges or Hooghly passes through historic towns like Murshidabad, Chandannagar and Kolkata to finally meet the Bay of Bengal creating the world’s largest mangrove forest at Sunderbans. The two cities considered holiest in India, Varanasi and Hardwar are situated on the banks of Ganges. These two cities and Allahabad are famous for religious worshipping, as every 12 years alternatively, Kumbh Mela (the largest religious fair in the world) is organized in these cities, allowing everyone to wash away their sins. The river Ganges is even mentioned in holy textbooks of Hinduism, Rig Veda, which is predicted to be 4000 years old. Many families also consider keeping a vial of Ganges water in the house as auspicious and also necessary to give to a dying person to drink it. Even scattering ashes over Ganges of loved ones after their death is a custom to be followed by every Hindu, which is mandatory, as it is believed, this will help the dead attain salvation. The city of Varanasi is famous as the cremation ground for pious Hindus. Among several temples in Varanasi, Kashi Vishwanath Temple along the banks of the Ganges is believed to be very sacred. The importance of Ganges spread over to the European countries through the writings of Megasthenes. In Ca. 350 – 290 BCE, Megasthenes, a traveler wrote about India and the River Ganges in his work, Indica. Even the river Ganges has been given tribute in a famous sculpture, the Fontana dei Quattro Fiumi (fountain of the four rivers) in Piazza Navona, in Rome designed by Gian Lorenzo. This sculpture symbolizes the four main rivers of the world, namely, the Ganges, the Danube, the Nile and the Río de la Plata.